Glass coatings prevent etching in the glass from buildup of minerals and soap scum. Our lifetime coatings are ShowerGuard by Guardian, and Clarvista by PPG. We are offer many different types of glass textures such as Satinvue, Rain, and various others. To view more examples of various glass textures, please visit Cristacurva.com. We use state-of-the-art equipment to ensure the best fit! We are able to install shower doors and enclosures to fit your taste and complete your perfect bathroom. We offer many different styles of textured glass for our custom shower enclosures. All selections are based on availability. The bathroom is your place for tranquil and relaxing moments in your home. A beautiful bathroom can act as haven to escape from the world for a little while. All American Glass can help you personalize and customize the details of your bathroom to fit your needs and help create a peaceful atmosphere to enjoy. 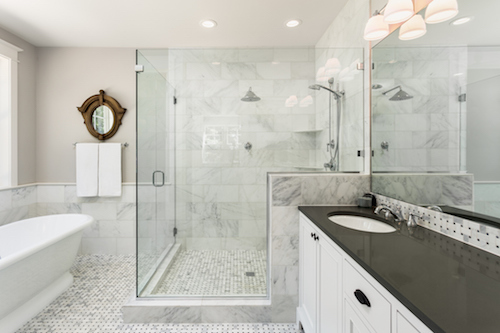 Glass shower doors are the norm in homes today. They create a clean and upscale look in any bathroom. Glass enclosed showers are also easy to maintain, and add value to your home. All American Glass specializes in custom shower enclosures. Our work includes frameless shower doors, framed shower doors, and tub enclosures. All American Glass experts will help guide you as you pick out the details of your perfect shower including glass design, hardware options, and space configuration. Trained technicians will be able to install a shower that is precisely measured and fitted to ensure the highest quality at an affordable price. Great quality of work. Todd is very professional, punctual and made the whole process of new shower enclosure installation very easy for us. Would definitely use him in the future and recommend to friends. Fast service, great communication. Will definitely recommend and use again. We recently had a shower door hinge replaced by Todd. He promptly returned all calls and texts. He came out and gave us an upfront estimate and informed us of what the work would entail. When the hinge arrived; Todd showed up exactly when he said he would, and had the hinge replaced quickly. He took the time to clean up after himself. He was professional and courteous throughout the entire process. We highly recommend Todd and All American Glass. We will certainly use them again in the future. Excellent service, experienced and professional. Our shower door looks very good. Mr Boyer advised us regarding Shower Guard and the type of glass we should use. He came by to take precise measurements with a laser device and the enclosure fits perfectly. The reviews in this business are accurate. He knows what he's doing. Very pleased with All American Glass in League City. Todd is very professional, diligent and nice. We had quotes from two other places, so happy we went with All American. Quality work, reasonable prices, and just no trouble at all. We recommend them! I am remodeling a condo and needed glass for 3 showers to be put in. I got a few quotes, but Todd from All American Glass stood out as very professional and easy to communicate with. I selected him to do the work and I am very pleased with the results. I would absolutely use his services again and I would recommend him to my friends. Excellent Quality and work. Todd was very nice and delivered just as promised. I highly recommend him. Todd provided many options and Installed a beautiful glass door that up-scaled my shower. Well done. Great work and very professional. Had several quotes and All American beat all of them. Will recommend to others! Great work, great price and a very professional experience overall. Professional, honest, dependable and the quality of the products and installations are the very best in the business!